Superintendent Dr. Brian Binggeli abruptly and mysteriously resigned from the Plano School District on Tuesday, just two years after he had left Brevard Public Schools in the wake of a multi-million dollar software purchasing scandal. Bingelli's resignation in Plano comes just days after BPS and the software contractor announced a settlement encompassing the scandal. Binggeli's resignation also coincided with another surprise resignation by Plano School District board member Greg Myer. A spokesperson for the Plano School District told the Dallas Morning News that "the only thing [the resignations had] in common is the timing." 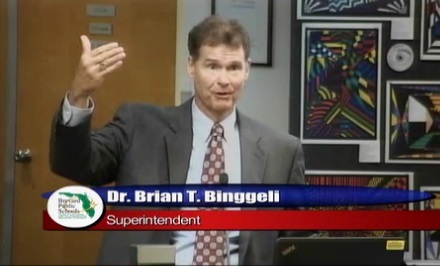 Binggeli's termination agreement from the Plano School District discharges him from "... any and all claims, actions and causes of action of any nature whatsoever related to Binggeli’s employment with District..."
The agreement defines claims as " .... any and all theories or recovery of whatsoever nature which each Party may have asserted, or could have asserted, against the other Party, regarding any issues related to Binggeli’s employment with District, whether known or now unknown ...."
Despite announcing a resignation in the middle of the school year, the Plano School District will pay Binggeli $307,000 in accrued vacation time plus nine months salary, CBSDFW reported.